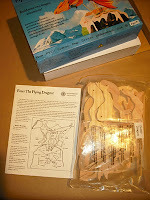 The Enter the Flying Dragon is a wood automaton kit produced by the Pathfinders Design and Technology. The completed automaton depicts a flying dragon measuring about 45 centimeters long. When a small hand-crank is turned, the dragon’s wings beat, its arms and legs move forward and back, and the head, neck and tail move up and down. The kit is intended to be assembled by builders age 9 years and older. I’m considerably older than 9 years old and I had a great time building it. I think it is fair to say that this kit is suitable for anyone who enjoys putting stuff together, mechanical things, and/or dragons. The kit comes in a cardboard box with no excess packaging. The dragon’s parts consist of pre-cut pieces of 1/4 inch thick solid wood and 1/8 inch thick plywood. Other parts include assorted dowels, plastic tubing, string, and four screw eyes. The kit also comes with a sturdy piece of sandpaper (needed for certain steps of the assembly) and white glue. Though the container of glue was small, I found that it was more than enough to complete the project. An instruction booklet completes the package. What is needed to assemble the kit? What was the experience of building it like? The kit contained all of the parts is was supposed to come with it. The pieces were cut well and the drill holes accurate. The wooden pieces required no tweaking whatsoever on my part. The 10 page instruction book has a playful tone, step-by-step written instructions, and very clear line drawings. You are building a piece of kinetic sculpture here. As such, there are 16 steps involved and you really do need to read the instructions -- including the notes adjacent to the drawings. Some of these are quite important. Some of the steps involve gluing pieces together. 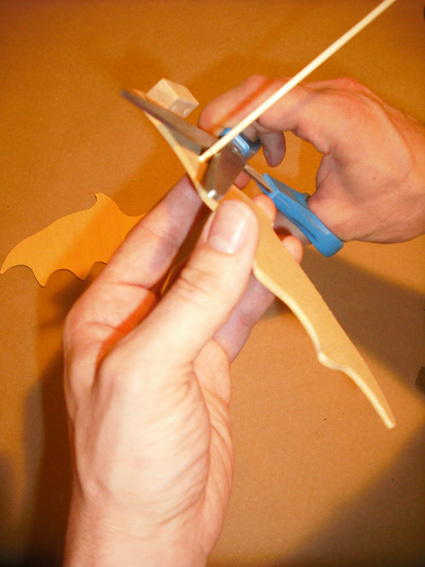 Because the glue will need to dry, you should expect to build your dragon automaton in a couple of shifts. The instructions call for scoring the thin dowels with scissors and then breaking them. I hadn’t tried this technique before and I wasn’t entirely sure it would work. Well, the technique worked just fine! Just be careful with the scissors and bend the dowel toward the notch made by the scissors. 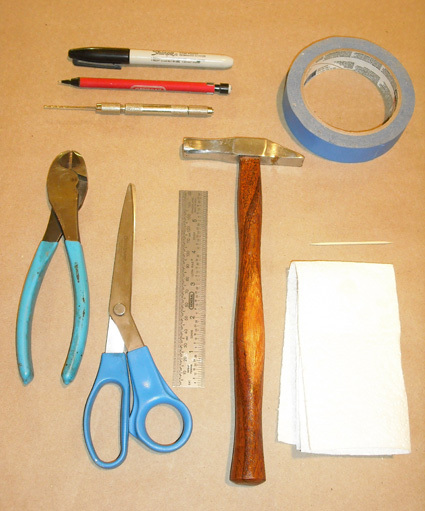 Alternatively, look up Pathfinder’s helpful article on how to use wire cutters to cut dowels. Where there any issues with the kit? I was a little confused in spots because not all of the parts specified in the directions correspond with what I found in the kit. For example, the 4.5 cm follower part listed in step 5 was actually 3.5 cm. This was not a big deal because the diagrams show the parts so clearly. You can also refer to the parts list illustration at the beginning of the booklet to sort out which pieces you need to use. The color of the wood parts varied a little. I had one darkish set of front and back legs and one lighter set. Some of the plywood has small gaps that have been filled, but they are so small. If you choose to paint your dragon as recommended, both of these things are non-issues. There is a coloring template at the back of the booklet that you can use to work out the color scheme of your dragon. Can you offer any tips and tricks? There are a few spots where you need to glue parts together, but NOT glue them to adjacent parts. With a little care this is pretty easy to avoid. You can also use a bit of wax paper between parts to keep them from being glued together. It’s worth the effort to sand the ends of the sticks where instructed. This makes it much easier to insert into the plastic tubing. I found a slight twisting motion helped too. You can learn a lot about basic machines from this kit. The automaton incorporates a crank shaft, axle, crank-slider, a follower, rigid and flexible linkages, pivots, and hinges. Likewise, a variety of ingenious construction techniques are used that would be valuable additions to any maker’s catalog of useful knowledge. My finished automaton needed only a tiny a bit of tuning to work smoothly. This was fully anticipated and addressed in the instructions. I merely had to move the two sides of the head a bit closer to each other and the arms a bit farther apart so they did not hit the head when in motion. 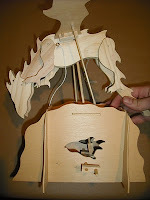 Having made, tweaked, and tuned many automata, I can tell you that this flying dragon was well designed. The finished piece is an attractive working wooden automaton. Whether you leave it unpainted or give it your own artistic touch, it is the kind of thing you will want to keep around and enjoy for a long time. In action, the dragon performs a dynamic compound motion. An automaton with a comparable amount of motion by an established automaton artist would easily cost hundreds of dollars. At its current price of $20 -- or even two or three times as much -- the Enter the Flying Dragon wooden automaton kit is a tremendous value. I highly recommend it. 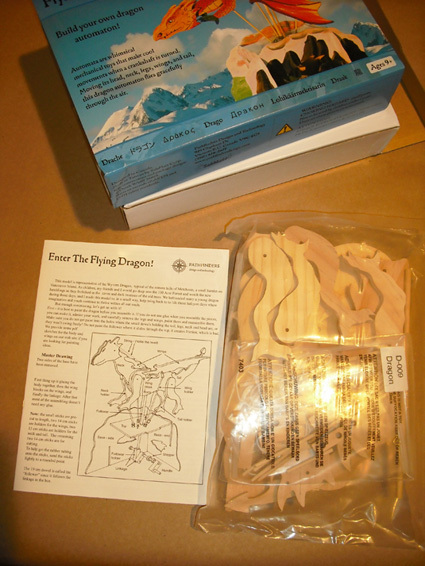 The Enter the Dragon Wooden Automaton Kit can be purchased directly from the Pathfinders web site where you can find an awesome assortment of wooden mechanical kits.